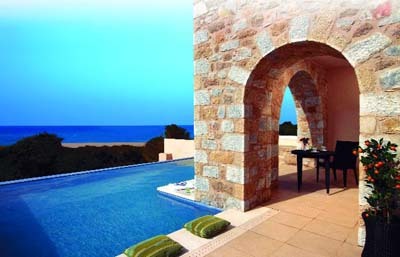 The Westin Resort Costa Navarino is the second property of Starwood Hotels and Resorts that operates at Costa Navarino, the new prime destination in the Mediterranean. Overlooking the Ionian Sea coastline of The Dunes Beach, the 445 rooms and suites, inspired by old Messinian mansions, spring from nature and create an ambiance of genuine hospitality. Most of the rooms enjoy unobstructed views of the Ionian Sea, while almost all ground-floor units have individual infinity pools and a mix of garden, golf and resort swimming pool views. 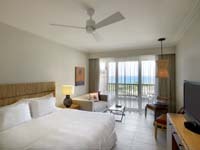 The Westin Resort Costa Navarino also provides a smoke-free environment in a purely sustainable destination while, at the same time, promises a restful sleep with the ultimate comfort of the Heavenly Bed®. 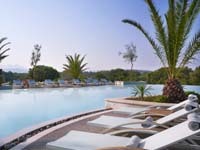 Voted as the “Best Family Destination” in the Mediterranean amongst Europe’s Starwood Hotels & Resorts, The Westin Resort Costa Navarino is the ideal destination for family getaways, presenting a plethora of children activities; a wonderful aqua park with water slides, a playground and a recreational center including an indoor sports arena for basketball and volleyball, ten–pin bowling, video arcades, cinema and ping pong. In addition, two specially designed hubs for children, Cocoon and SandCastle, are the most innovative and supporting facility for family holidays at the resort. Cocoon is addressed to our little toddlers and up to the age of 3, while SandCastle offers an extensive range of educational and recreation activities for kids between 4 and 12 years of age. For the ultimate gastronomic delight of your palate, The Westin Resort Costa Navarino is the pioneer regarding the number of choices. Start your day with a buffet breakfast that includes dishes rich in antioxidant foods and SuperfoodsRX®, combining certain raw materials to offer you all of their benefits and flavors. Flame restaurant is an exceptional venue, located at golf’s Clubhouse, offering magnificent golf landscapes and sunset views. Flame menu includes home-grown meat, selected from local farms, combined with the finest and freshest materials from the best local producers of each area, together with seasonal vegetables and herbs that are handpicked just before the food preparation. 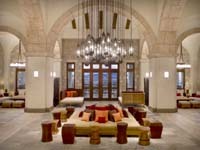 Whether you prefer Mediterranean or international cuisine, local Greek, Lebanese, Italian or Pan Asian, The Westin Resort Costa Navarino has many more to offer with its vast variety of venues and special concepts. Pampering through the day you may relax by the lounge areas or pool bars and enjoy fresh juices and tasteful cocktails, snacks and delicious deserts or experience a signature oleotherapy® treatment at Anazoe Spa. 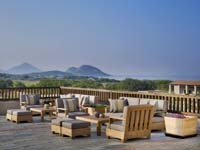 Two signature golf courses, 18-hole and par-71 each, set Costa Navarino as the new luxury golf destination in Greece. The Dunes Course has been designed by the US Masters Champion and Ryder Cup Captain Bernhard Langer, in association with European Golf Design, and offers an exciting round of play along with spectacular sea and river views. Alternatively, The Bay Course - just a few minutes from The Westin Resort Costa Navarino and next to the historic Navarino Bay, proposes a different set of challenges and choices, with greater emphasis on strategic play and positional golf. The Bay Course has been designed by the internationally acclaimed architect Robert Trent Jones Jr.
For those who seek more adventures, or exercise for their body and mind, the options are endless. Energize yourselves with Navarino Outdoors, Navarino Sea and Navarino Racquet Academy. Learn more about the surrounding area, exploring the nearby attractions and train your body with unique experiences through bicycle tours, hiking and Nordic walking. Navarino Sea will be your perfect guide under-water with experienced divers for scuba diving and snorkeling or on-water with non-motorized sports, varying from windsurfing and paddle boarding to kite-surf. Racquet enthusiasts will choose among nine different racquet sports and play in any of the two tennis courts. Mini tennis courts are also available for our younger guests. 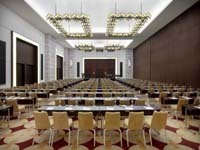 Finally, the 5000m2 conference and meeting spaces, place The Westin Resort Costa Navarino amongst the ultimate choices for successful incentives, conventions and events. Featuring the latest state-of-the-art conference facilities and a totally versatile function area which combines in-house and outdoor options, The Westin Resort Costa Navarino is the preferred location to organize and present your business in perfect success. Our experienced team will assist you setting everything in time and to the tiniest detail.